There are those who roll their eyes at the mention of another Mexican restaurant opening in Humboldt. And fine, I just did a quick count of around 60. Whatever. The cuisine of Mexico contains multitudes and we have merely scraped its surface here. The vibe at Tuyas (553 Main St., Ferndale) is modern and a little swanky, with rough-hewn meta-beams suspended from the ceiling, Andrei Hedstrom's rainbow-jubilant paintings and a feast-ready redwood table and benches. 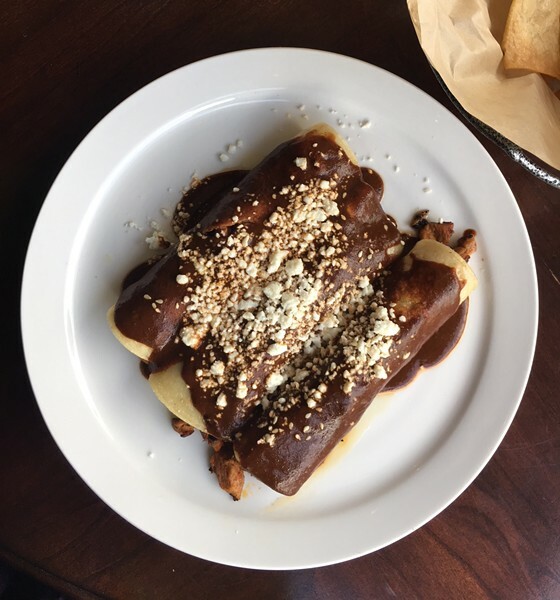 Chef Gillermo Dominguez's take on mole enchiladas is good enough to steal your attention from all that ($14). On a recent rainy afternoon, we went with the adobada pork filling, which was juicy, charred here and there, and lightened with warm chunks of pineapple. The freshly made corn tortillas, fried to a crepe-like chewiness, were cloaked in smooth, nutty chocolate sauce and a scattering of queso fresco. The dark sauce is just warmed with chilis and more creamy than smoky or bitter. It's the kind of labor-intensive dish that makes one a little sentimental: It reminds you that someone stood at a stove and cooked for you for as long as it took. Sidebar: If you feel $14 is too much for a plate of mole enchiladas without a belly-distending side of beans and rice, reconsider. That is, think about what it costs to get good pork, spices — sweet Jesus, the price of chocolate — and the hours of labor that go into making mole and then think about what you'd pay for a French meal that takes six hours to make. We are generally paying too little for Mexican food and giving too little respect to its cooks. Keep it in mind and tip generously the next time you get a burrito.